Step 1 Heat the broiler by placing the broiler rack about 4 inches away from the source of heat. Turn heat to high. Step 2 Set aside 3 tablespoons of the butter. In a medium bowl, stir together the remaining butter, bread crumbs, cheese, onion and rosemary. Add 1 teaspoon salt and 1 teaspoon pepper, or to taste. Step 3Spread each chop on both sides with the reserved 3 tablespoons butter. Sprinkle each chop with one-fourth teaspoon salt and a good pinch of pepper. Step 5Remove the chops from the broiler and evenly distribute the crust among the chops, coating each top generously. Return the chops to the broiler and cook until the crust is golden brown, watching carefully, 1 1/2 to 2 minutes. Serve immediately. In Recipes-list.com we have selected the most viewed recipes from category - Main courses Quick and easy . Enjoy the best recipes specially selected for you! 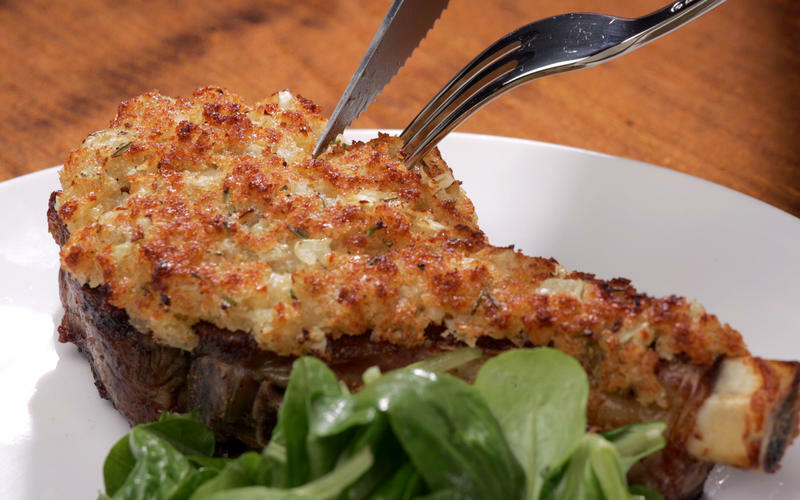 Rosemary- Parmesan crusted veal chops is the right choice that will satisfy all your claims.